In our range of trolleys, many are suited to use in fruit & vegetable handling, however, we also make some for specific tasks in the preparation and sales areas of the fruit and vegetable department. Details of some of these standard trolleys are shown below. Designed to hold eight of the No. 10 Staka-Nesta Crates, and finished in hot dip gal. for continuous use in damp areas, this trolley is suitable for storage and movement of bulky and pre-packed stock. To save space in the storeroom when not full, it is shorter than two crates end to end. The side rails are slightly higher than the shelf to help guide the crates when loaded from the end. There is often a need to trim produce in the sales area when topping up or straightening stock. 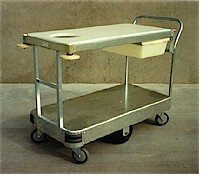 To cover this need, the standard stock trolley base (TS/075) is used with a special top deck designed for this purpose. The frame is mounted higher and has a 15mm thick high density polyethylene board on top for cutting and trimming. This board is removable for cleaning. The trolley has a plastic crate on runners underneath for knives, tickets, string etc. and is fitted with buffers to the front corners of the top. In addition to this, the trolley has a hole cut in the top to allow scraps to be swept through into a rubbish bin which can be placed on the bottom deck.